Nostalgia sells. It sells to fifty-something misfits longing for validation of ageing obsessions and infatuations and it sells to twenty-something hipsters desperate to unearth past histories that help in the construction of carefully curated personalities. Now it should be stressed perhaps that I say these things in only a marginally pejorative sense, for there is nothing really wrong with any of this. When one reaches these particular punctuation points of age, after all, these are the (un)natural impulses insisted upon by heavily mediated cultures. If we do not embrace them then what are the alternatives? To fall sheepishly in line with the expectations of the lowest common denominator? To switch off, detach, dissolve into… what? In truth, there are few moments of Pop music’s past that I would encourage excavation of more than those of Felt. 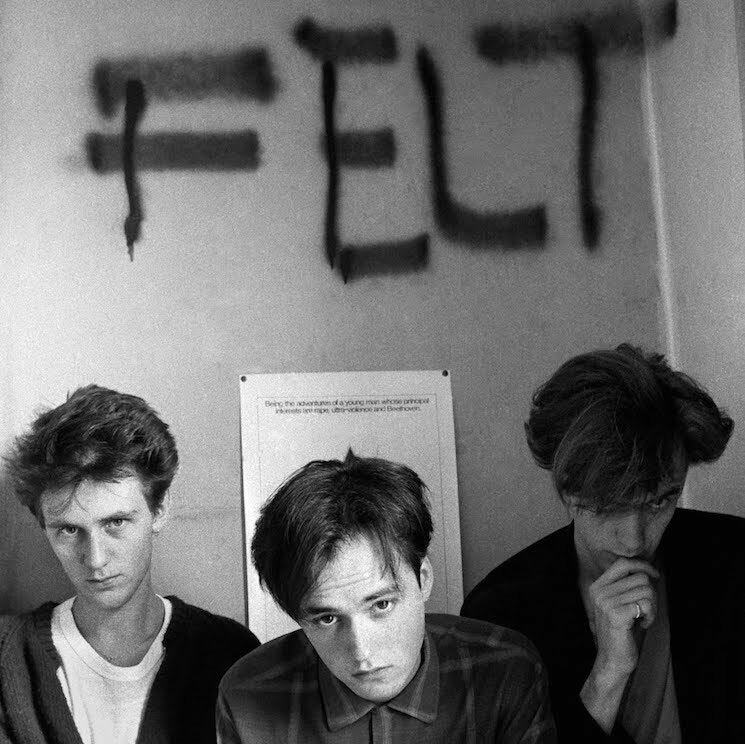 For those of us who chose to align ourselves with particular elements of what might loosely be couched as a 1980s ‘counterculture’ (and even then, only perhaps a very specific sub-genre) then the records of Felt were surely an important touchstone. There was mystery, magic, otherworldliness. There were threads and there were threads. There were details and there were details. One could indulge in language both textual and musical. Even if one did not entirely understand either. Especially if one did not understand either. Felt kept the mystery caged. Felt kept the mystery caged perhaps too well, for paradoxically Lawrence always saw himself more in the role of Mainstream Pop Star rather than Obscure Indie Idol. 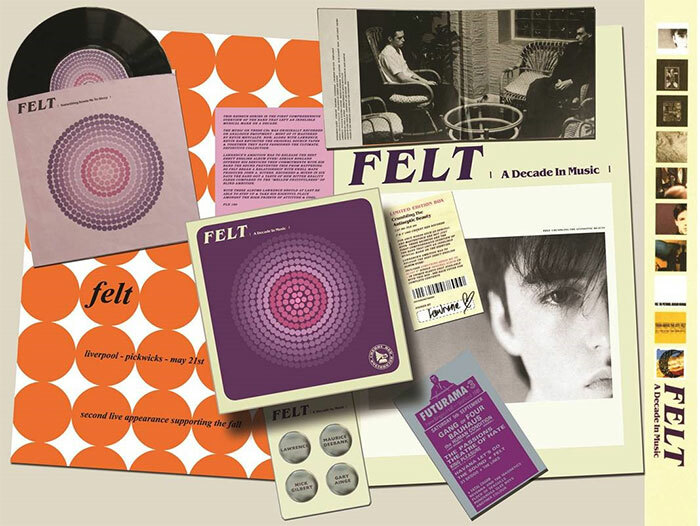 Intriguingly in the thirty plus years since the five albums that make up the first instalment of the latest Felt re-issue extravaganza (all ten Felt albums were previously repackaged in gorgeous card gatefold CD packs) the mythology of Lawrence and of Felt has developed in a most gratifying manner. From sprawling purple prose enthusing in small-press publications to lavish photographic coffee-table books and feature length documentary film, the stories of Lawrence and Felt have been almost continually Out There for people to avidly devour. And they have. We have. We pick apart the bones like deranged cultural archaeologists looking for clues. It’s all part of the thrill. All part of the curse. Of course, it is impossible to listen to music divorced from the contexts of personal memory, so I cannot listen to any of these Felt records in 2018 and construct meaning on a completely blank canvas. When I listen to these records now I tremble at the familiarity. Their impact is physical. I would be fascinated to know what virgin ears and eyes would make of it all. Will it still seem strangely beautiful or will the threads and connections they sent into the future weave back and bind them in perverse back-to-front notions of influence? Will it sound and look as special as the words we all wrote and continue to write suggest? And are we over-selling ourselves? Perhaps. Perhaps. For those in the know (and let’s face it, the people who are going to pay this kind of money to buy new versions of their record collections are going to be infuriatingly in the know) there are few surprises in the repackaged albums. Even the retitling of Let The Snakes Crinkle Their Heads To Death as The Seventeenth Century and the culling of one track (‘Serpent Shade’) from Ignite The Seven Canons to give it symmetrical track listing are hardly unexpected. For what it’s worth a few more details to consider are that the front cover of Crumbling The Antiseptic Beauty features the more commonly known ‘half face’ portrait of Lawrence (but without the black bar) as opposed to the full face on the first pressings whilst Snakes/17th Century has the detail of belt and cardigan cropped from the first pressing’s full band photo. And I mean to say, you do have those versions in your collections, don’t you? Well don’t you? So yes, the gatefold sleeves of the vinyl and the packaging of the CD box sets for each of these releases look gorgeous. When I spoke with Lawrence some twenty years ago about possibly writing the story of Felt we enthused about making something as visual as it was textual. With these boxes it appears he has fulfilled that wish, for they fittingly include facsimiles of mementoes that bristle with contextual flavour. One could be witheringly harsh of course and say they are as charmless as reconstructions of Georgian country houses for monied elites, but perhaps this might miss a point about Pop being all about mass production of artefact and indeed of copious copying of moment and memory. Ultimately you pays your money and you makes your choice. Or you don’t. So, nostalgia sells, but here’s my point of departure. Here is the point I say “no further”. Here is the moment to tell you there is no more space on my shelves for artefacts I find myself collecting almost exclusively for the habit of collection and curation. Here is the fragment of my time when I reflect that my memories are simultaneously as intact and as fragile as they have ever been and ever will be again. The sounds I hear tease me with thrills as ageless as I am ageing, prick me with pleasures as profoundly moving as they are fleetingly transient. These things I treasure as much as I do the creases on cardboard sleeves imprinted with fading inks. Do I need reminding? Always. Do I need shiny new constructions of the dreams? Not so much. Does newness sell as much as nostalgia? I do not know. What I do know is that whilst I leave the delicious looking Felt re-issues on the shelf for more avid collectors to hoover up, I am gleefully shelling out my hard-earned cash on the new record by Go-Kart Mozart. It has been six years since the last Go-Kart Mozart record (the euphoric, unsettling, touching and sneeringly bonkers genius of On The Hot-Dog Streets) and boy is it worth the wait. When Hot-Dog lit up 2012 I said it was easily Lawrence’s most accessible and accomplished record since the startlingly brilliant and ahead-of-its-time Back In Denim. I’m delighted to tell you that Mozarts’ Mini-Mart now builds on those foundations and claims the title of the most perfect NoveltyTrashPopGlamPunkWhatever record you are likely to hear this week, month, year or ever. Yes yes, Pure Pop hyperbole and that is part of the nod and the knowing wink I’m throwing you, but really, really, really. It’s True. Mini-Mart reeks of bubblegum perfume and tastes of Bazooka Joe acid drops. The video for the magnificent ‘When You’re Depressed’ seems to posit the perfectly Pop idea of Lawrence as idea rather than individual, persona as opposed to person. Young figures inhabit what to long-standing fans (and tragically, this is still the most likely audience for this record) are instantly recognisable as Lawrence outfits. The ploy infuses the whole thing with the aura of youthful playfulness and crucial cool, although whether any younger tastemakers and influencers will ever see it and then agree with my take is another matter. It’s a great song that treads the tightrope between objectifying and devaluing mental health through humour and being drearily serious and worthy. Lawrence carries it off with aplomb, delivering darkly funny lines in a detached monotone that you suspect are also deeply personal and real. There are moments when it seems to mirror ‘Ballad of The Band’s infamous “Ain’t got no money, Ain’t got no fame” and that’s painful and poignant. One wonders too if Lawrence is still tied to Richard Hell’s notion that the extent to which we remain alive is determined by the extent to which we stick to the attitudes we had as teenagers. One hopes not so much, but one suspects that’s not so. Lawrence still believes in his destiny as Star but perhaps here there are suggestions of an acknowledgement that Stardom might come from what he has passed to those yet to come. Fame by proxy if you will. Now we all know the value of repetition to Pop so I shall repeat what I said in my past and tell you that Mini-Mart is, like Back In Denim and Hot-Dog Streets, a peculiar protest record; a collection of songs that exists almost entirely within its (i.e. Lawrence’s) own carefully mythologised context. Fittingly though this is the soundtrack of protest that simultaneously colludes; is observation and implicit/explicit rejection of the mainstream absurdities that acknowledges the chip on the shoulder that says “yeah but wouldn’t it be good to be part of it?”. Locked out of the love-in. Locked in to the darkness but sprinkling glitter and poverty glam on every available surface despite it all. Because of it all. Mini-Mart is Pop that consumes itself. There are riffs and melodies beamed in from Pop’s fast, refracted through its future. You will hear refrains that make you go ‘oh gosh that’s… what is that?… I remember… no I don’t… and what does it matter and who really cares’ and you simply slip into loving the moment even more. Because it’s infected with a past you can only-barely-can’t-even remember and a Now that’s difficult and awkward and mesmerisingly, unremittingly bleak BUT. But you have these songs and these bitter twisted jokes. Anger and envy. Desire and dejection. Shot by both sides, dancing in the deluge of despair. That’s 2018 and that’s Pop. That’s Mozart’s Mini-Mart. This entry was posted on 31 January, 2018 in homepage and tagged Alistair Fitchett, Felt, Felt – A Decade In Music, Go-Kart Mozart Mozart’s Mini-Mart. Bookmark the permalink.